It's coming. We're set to break temperature records that I'd much rather let stand. We're braced and ready for it. I got up early today and did my lap downtown. It was sunny but windy, and when I got home the snow was drifting over the driveway again. So I spent an hour with the snow shovel and got it cleared off down to dry pavement. Then I had cookies to bake and presents to wrap, and all that snow shoveling necessitated a shower. We had the big extended-family Christmas at Jen's, and it was wonderful. I love it when everybody gets together. We ate, opened presents, talked, laughed, and had way too much fun. My cookies and presents were successes. For presents, I went to Lollys and bought that wonderful soft fuzzy fabric they have in the basement shop, and made throws for everybody. I splurged, since they were the only gifts I bought this year. And we will need all the blankets we can find. 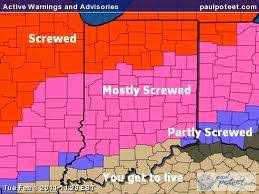 The forecast is for dangerous cold and wind chills as low as -45, and another foot of snow arriving at an inch per hour. Area schools are closed for Monday and Tuesday, and church has been cancelled for tomorrow. The county sheriff's office is putting out warnings in the strongest possible words. I very much doubt that I'll be working on Tuesday. We're as ready as we can be. I have a full tank of gas, dog food, cat food, and a new gallon of milk. As long as the electricity holds, we'll be fine. And there's plenty that needs to be done here - I won't be idle. And, like I said last night, if the power goes out, we'll all just come and stay with you.